Discussion in 'Dovetail Live Article Discussion' started by TrainSim-James, Nov 8, 2018. 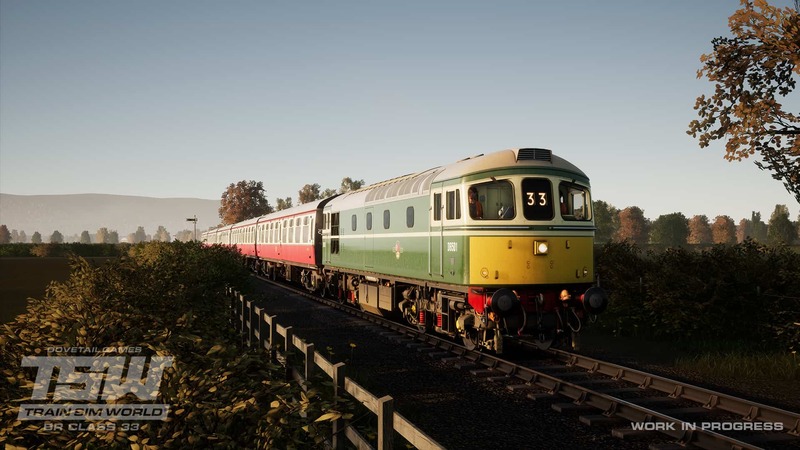 The classic BR Class 33 is coming soon to Train Sim World, initially for Windows PC. Hopefully coming to consoles. This loco looks good! Looks like a great offering. Shame it cant be dropped into gwe as a shunter or freight loco on some additional services. I probably wont get it simply because the wsr, while beautiful, is just a bit too slow to take either the 47 or this new offering out for a proper drive. Id be glued to the pc if both of these were on gwe. A class 33 for the WSR, nice! Cool addition. Gonna add this to my collection. P.S. Those of you wanting to utilize it on other routes (as well as any other train, currently available), other than what looks to be WSR from the image, are gonna have to wait for the tools to drop, later this year. according to the article this will be only for PC? Will the AI locomotives on WSR be fixed so they have exhaust smoke? Says in article, "Initially, for PC". Meaning it'll come to consoles at a later, un-specified date. This was certainly not something that I was expecting, however I am looking forward to the release of this loco. Hopefully more loco dlc are being made for other routes such as RSN and GWE as well. The loco looks to be of high quality, quality is certainly now improving in TSW dlc with LIRR also appearing to be of a high quality. As I'm already happy for LIRR, this together with the editor will shape TSW to the point we have been seing in the distance all along. Very happy to see a loco dlc coming out, would have been better with a steam loco of course, because this is WSR, but happy to see another well known loco from the UK in TSW. I expect this to be a paid DLC, but it's not clear to me from the text. Do we know anything about this? Don't know if DLCs can have DLC dependencies on Steam? This will be a paid dlc, as it will probably follow the current dlc pattern. Good to see a Class 33 coming for the West Somerset Railway. Hopefully, it will be possible to use it on other routes also, once the necessary tools become available. Who are "we"? Got fleas? Yet another attempt by a single individual to speak for everyone on the forums. Phooey! Can we expect a patch with any fixes/updates for gwe/wsr at the same time as release of this great looking BoBo? Im thinking just some of the minor niggles that temper immersion like passengers all standing in a row on wsr with their backs to the train, reflections through objects on GWE which as an east west route is more pronounced, traction update, signals on the gwe (flashing yellows), and last but not least the horrible sky with clouds that are supersonic in the wind. The direction and quality of the recent stuff is great, but the deafening silence about any fixes is beyond old now, and I cannot see the obvious benefits of maintaining that silence over obvious issues. Its a great little harmless hobby driving on a simulated railroad, and all I want is for some kind of acknowledgement that the issues are in hand. The lack of formal updates is coming across as a bit pointless and certainly having a negative impact on this customer. Shortly Ill be making the jump to run8 not out of spite, but as a disappointed enthusiast. Come on DTG, give me a reason to keep the faith.. The traction updates might get released with LIRR. This looks nice! Might not buy it immediately, locos don't offer as much as routes. I'll probably wait a few months for a discount. One small thing, though- if you can change the headcode on this, can destination boards be added to other DLC in the same way? Be sure to let me know via here or PM how you like Run 8, I've been seriously considering buying it myself. I would imagine that headcodes and destination blinds work differently, though I'm not too sure. On a heritage railway, headcodes aren't really used, so they would probably be left either blank or something to the effect of "00" or "AA". A destination board system, however, requires a train to know which service it's running, where it's going to, and what the next station is, plus, all of that has to change when the service ends. I would imagine that a PIS of some sort is being worked on as we speak, and I suspect we'll hear about that sooner rather than later. If I do, I will. I agree a set of freight wagons would be a really good addition to the WSR route would then allow shunting and demonstration runs along the line. DLCs can have DLC dependencies as long as it's clearly stated in it's description. DTG is not the only developer that does that. I meant more on the technical side, so that you would be prevented from buying it if you do not own all the dependencies, as it currently works. ...has DTG not looked at the Mod Hub on FS19? Whats the update today 1.06 PS4? I appreciate the constant down voting whoever you are Alex? Ive got some more recent posts on here incase you want to find and downvote them too. Northlander- Even on AAA games such as FIFA, the updates always seem to hit steam 1 week prior to consoles. PS and Microsoft stores only update certain times of the week. Plus new DLC has to be given the stamp of approval by Sony and Microsoft. I this might be the case today, download 1.06 installed but no info. My suspicion is that this is the Crompton. Awaiting Sony to update store.